I must admit to being a fan of the Nightrunner series ever since I stumbled across the first book. 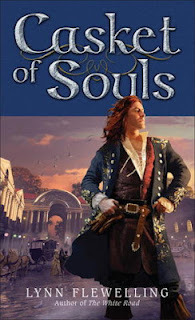 I fell madly in love with Alec and Seregil even though I did have trouble with book four, Shadows Return. To me it really seemed to drag. However they are back in fine form in CASKET OF SOULS. With the exception of the very first book, Luck in the Shadows, CASKET OF SOULS has to be my favorite. It is set in Rhíminee and we get to watch two masters of the shadows ply their craft as they work to discover who all is in the various factions that are not happy with the current Queen. Also children from the poorer quarters are dying which really concerns Alec. While he is investigating that, close friends of both of them start to die without a mark on them. Is there any way that the two are connected? We get to watch Seregil deal with his fears over losing Alec again and Thero try to throttle his love for a completely inappropriate woman. In doing so, we get to know them better than ever before. I highly recommend CASKET OF SOULS to any followers of the Nightrunner series. It is well worth the wait. And to any lovers of dark fantasy, I recommend the entire series. ***I received this book for no charge from NetGalley in exchange for a fair and honest review. No monies have or will exchange hands.